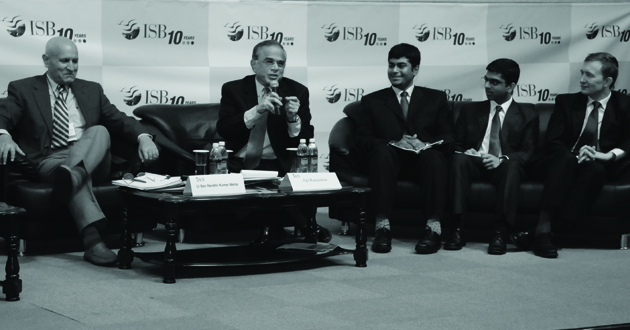 “India at an Inflection Point,” was the theme of this year’s ISB Leadership Summit. A timely assessment of where the country is headed 20 years after opening its economic doors to the world, the event hosted 45 industry leaders, who through interactive panel discussions, presented their perspectives on the path ahead for the nation. The two-day ISB Leadership Summit held on campus recently presented a confluence of ideas by India’s noted industry and thought leaders on the direction the country must take at this inflection point in order to remain a key global competitor in the future. Through panel discussions organised by the professionals clubs at ISB, the summit brought out debates and discussions on areas pertinent to the country’s development. A panel discussion on “Bottom of the Pyramid” brought to the fore the need to evaluate our parameters of measuring poverty. According to noted economist and Visiting Faculty at ISB, A K Shiva Kumar, parameters such as access to education and healthcare must be utilised to define who populate the bottom of the pyramid. Managing Director and Co-founder of Peepul Capital, Srini Raju underscored the importance of technology and training in helping the poor. This training is extremely vital as their mind-set needs to change. Formal training will facilitate self-reliance and help the poor enter the mainstream workforce at par with the rest of the population. Hence, training institutes such as the one being set up by National Innovation Council, keeping in line with the National Skill Development initiative, play a very important part in the path ahead. In the panel discussion on “The Changing Face of Indian Healthcare,” K G Ananthakrishnan, Managing Director, MSD India spoke about the four key problems in the healthcare-pharmaceutical sector: accessibility, awareness, affordability, and acceptability. He particularly stressed on awareness as the focal point of all the problems. Ananthakrishnan spoke of the trends in healthcare, such as the shift in the disease profile of the population towards chronic diseases, which represents an opportunity for pharmaceutical companies. Directi’s Founder and CEO, Bhavin Thurakhia, in the panel discussion on “Technology 3.0 – Innovation, Inclusion & Disruption,” spoke about the opportunity India holds in the online landscape and the gap that budding entrepreneurs could fill. However, for these entrepreneurs to realise their dreams and contribute to the India growth story, a better and far-reaching education system, supportive government policies and a risk-taking attitude, is required. Ajit Sarkar, Google’s Director of Online Sales, expanded upon Thurakhia’s point to highlight how the social media revolution is helping ordinary people realise their dreams, by providing low-cost alternatives to compete with the more established players in the market. He cited the example of the viral song “Kolaveri Di,” amongst others, to highlight innovative techniques, which have stood out from the clutter and made obscure artists household names overnight. This article was contributed by the staff and affiliated contributors of ISBInsight.